Tensions at a Belfast interface remain high today after a chilling picture in which a gang of loyalists threatens to “crucify” Catholics appeared on social media on Monday afternoon. 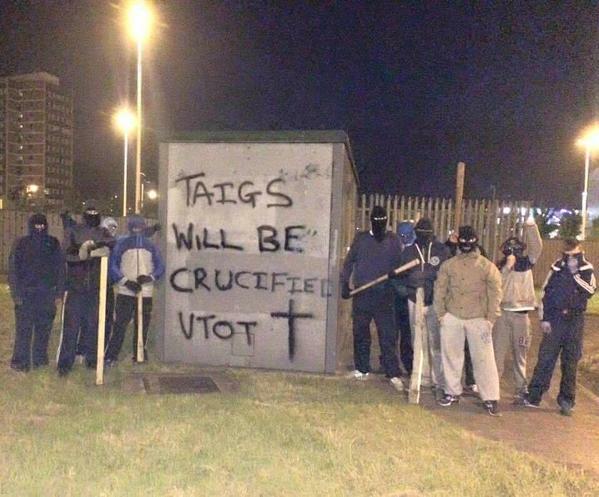 The shocking picture shows a gang of around a dozen masked men armed with wooden staves standing beside the deadly graffiti message ‘Taigs Will Be Crucified. VTOT’ just yards from the busy Westlink. The acronym VTOT has been variously claimed to stand for ‘Village Team On Tour’ and ‘Victory To Our Troops’. The site at the Broadway roundabout where the picture was taken is in the shadow of the landmark ‘Balls on the Falls’ and is close to two loyalist bonfires. Loyalist social media sites have been a hotbed of anger and unrest following the premature ignition of a number of bonfires, notably the monster Sandy Row edifice, which was torched in broad daylight on Thursday, June 25, sending a thick plume of toxic black smoke into the sky. While many loyalists have angrily claimed that republicans were responsible for that and other bonfire ignitions, no evidence has yet emerged to back that theory. Sinn Féin MLA Fra McCann said he’ll be reporting the picture to the PSNI as a “sectarian hate crime” and urged people in the Broadway area to stay alert. “The appearance of an image on social media with up to 12 masked loyalists armed with cudgels and baseball bats standing beside graffiti stating that ‘Taigs will be crucified’ is extremely sinister,” he said. “The picture was clearly taken at Broadway roundabout and will only heighten tensions as we approach the 12th .